Just had an interesting conversation with a professional estimator about the plugin this morning. He reinforced what already I'm seeing with this plugin and how it relates to design, designers and architects. As I've mentioned previously the plugin audience is three fold and the design side probably will utilize the 2D and 3D (no framing) mode the most. The reason being is that most designers are not overly interested in how the structure goes together, their main concern is the layout and placement of windows and doors. 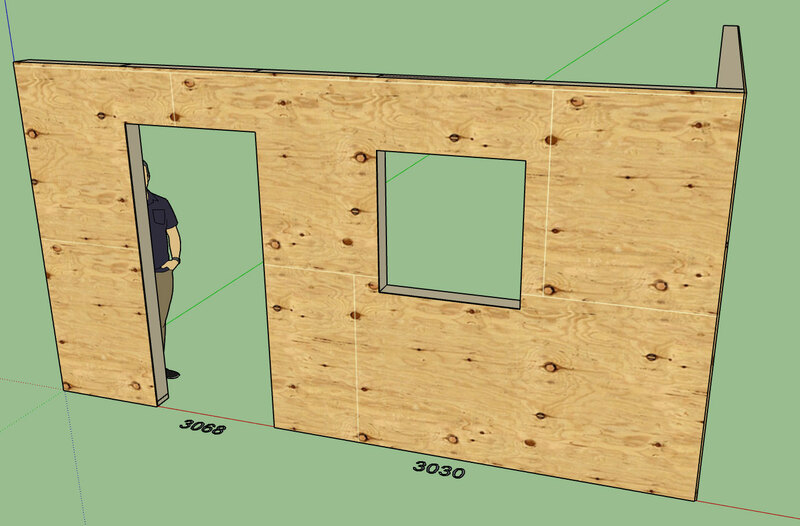 The full framing mode will have more utility among the engineers, panel designers, estimators, contractors and DIYers. A building design is really no more than a concept and it takes a whole team of professionals to take something off of paper (or pdf) and make it into a physical reality. Once I have the design side of this software put together and reasonably solid I will begin focusing on the engineering and estimating pieces. This estimator talked at length about the disconnect between himself and the architects. My goal is to help heal this disconnect and get everyone on the same page, I think we can do this. - Auto-Corner Configuration algorithm revised to handle "stepped" walls. - Wall "Draw Tool" configured to retain most recent inputs from user. Parameters not shown in UI default to global settings. This sub. revision is actually fairly significant and worth upgrading to since it addresses a major flaw in the UI. - Added the option to toggle between standard stud sizes and custom (user defined width x depth) sizes with the "Walls" tab of the global settings. Note that within the wall edit menu the stud width and depth can be adjusted independently regardless of the standard stud size option being enabled. - Fixed a bug with the wall sheathing and cladding so that door openings are properly cut out even when the vertical offset parameter is negative. I incorrectly assumed that this state would never occur but apparently there are situations that involve reverse brick ledgers where the sheathing and cladding is lifted up in this fashion. This morning I am spending a little extra time on the auto-corner config module and the related module that checks for tee intersections. It has been brought to my attention that this area of the plugin is not as robust as it needs to be. I've already made a number of minor corrections and augmentations but if anyone has a particular case that is throwing an error or unexpected result please send that information along. I need some feedback on another marketing strategy for the plugin. I'm thinking about creating a lite version Medeek Wall Plugin LT, this version would only have the 2D and 3D (no framing) mode available to it. The interior of the wall (framing, studs, headers etc...) would not be included in the LT version, nor would holdowns and any engineering. 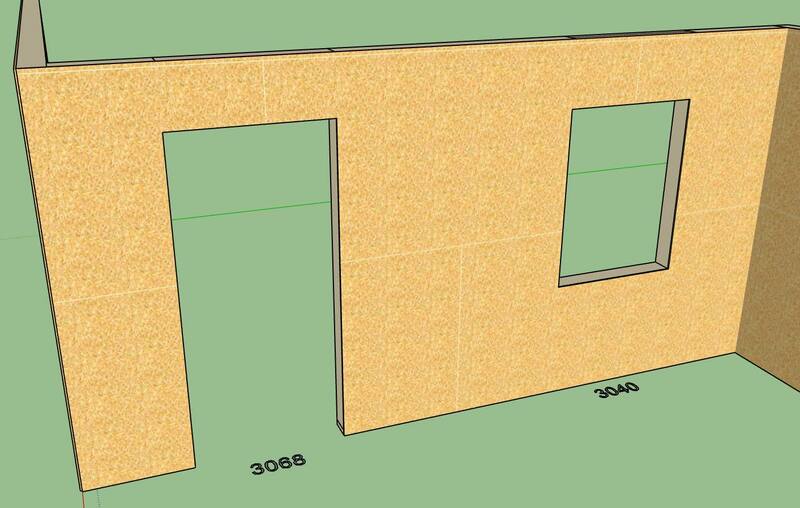 The LT version may be more suitable for some designers who do not want to be bothered with the details of the construction and are only interested in the layout. The ability to insert windows and doors as well as all of the trim and casing options would still be available in the LT version. What would you suggest as the regular price for an LT version? Is there any interest in this direction? A placement parameter will allow one to specify Top Center or Bottom Center. A ply (qty.) parameter will allow for multi-ply beams, this is typical for LVL beams and sawn lumber. My idea on this draw tool is to have the HTML menu stay open allowing the user to draw as many beams as desired with the ability to change any of the settings within the HTML menu and then being able to resume drawing beams. If this type of menu/tool system works well I will probably adopt something similar for the Wall Draw Tools. Had an interesting email today on the complexity of the plugin. I agree that the menus are a bit daunting even for myself, and I even know what each parameter is and does. I've discussed this previously in the thread with an idea to go to an HTML menu that hopefully might be less "scary". People like the simplicity of SketchUp, that is what has drawn many of us to it. Then I turn around a throw a bunch of menus at you with 15-20 parameters each, I can understand how this can be a bit much for many people. As I've been contemplating this problem and trying to find a solution (compromise) I've come up with the following idea. Essentially have the draw wall tool present an HTML menu not to dissimilar from the current HTML edit menu. However organize the options that turn off the various advanced options into highlighted headers with all of the sub-details hidden unless those particular header items are enabled. It may take a few iterations to get this right but I think it would be better than the current system of multiple menus that pop up one after the other. I'm not a software developer or a GUI expert but when I hit upon the right solution I will know when it is right. As far as decreasing the depth of the plugin, that cannot be done. What can be improved upon is the ability to better manage that data and organize and present it in a more concise and clear fashion. This is the reason for the extensive global settings, the user can enable or disable the default behavior for a number of parameters and options allowing the user to precisely determine to what level of granularity they wish to take their model. For instance many people probably don't want to model the cavity insulation (personally I don't find it that useful) but if that level of detail is needed it can be turned on in the insulation tab of the global settings. Please continue to send me your feedback. I have lots of ideas on how this plugin should go together but I've changed gears a few times already when shown a different way. - Added the ability to lock the cursor to the X or Y axis for the "Draw Wall Tool" (line and polyline) by pressing the SHIFT key. - Added the ability to lock the cursor to the 45 deg. and 135 deg. axis for the "Draw Wall Tool" (line and polyline) by pressing the CTRL key. Also note that I fixed a couple of bugs I accidentally created when making the code adjustments for version 0.7.6e, I managed to break the plugin for all TRIAL users. Therefore this is a critical update, please remove the prior version and install this version which will fix the error introduced last night. This is what happens when I try to get too much done in one day. 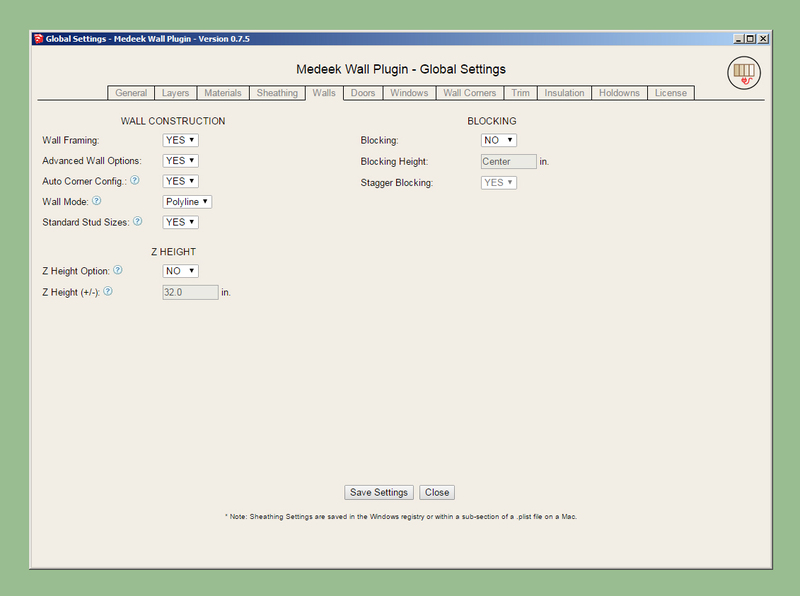 - Created the Medeek Wall Plugin LT, a lighter version of the plugin with internal wall framing, estimating and engineering removed. - Horizontal and Vertical sheathing materials added to the pre-installed plugin materials. I've been getting a lot of feedback on the UI lately, for good reason of course (it's terrible). The wall draw tool with its multiple menus is what I am talking about. 1.) Go to an HTML menu, similar in design to the current edit menu that remains open during wall creation and allows the user to make changes during wall creation with the polyline tool (ie. changing wall height on specific wall segments that are in a drop down living room). 2.) Enabling user presets where all of the basic and advanced parameters for a wall are saved to a user defined preset that can be instantly recalled within both the wall draw and edit menus. For example, this would allow the user to quickly define and then recall a 2x6 ext. wall with a 1" air gap and brick cladding, rather than having to peruse through all of the settings every time and recreating the wheel just to put together a standard wall type. 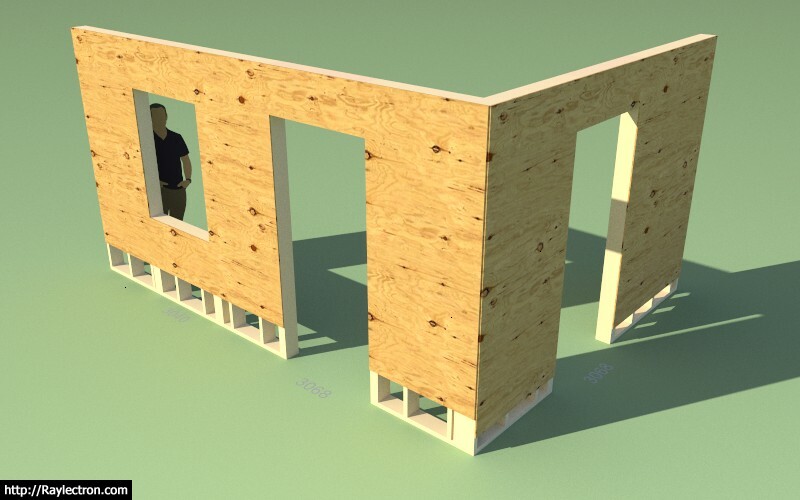 - Horizontal and Vertical plywood sheathing materials added to the pre-installed plugin materials. I realize this a fairly insignificant item, but it was user requested and one of those things I could knock out in about 10 minutes or less. 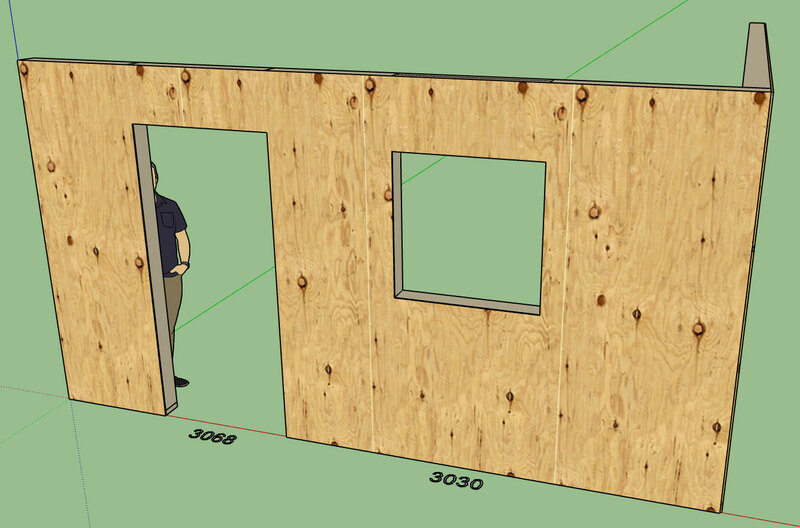 Only the outside face of the sheathing gets the Tyvek material and the sheathing group gets the generic OSB material. 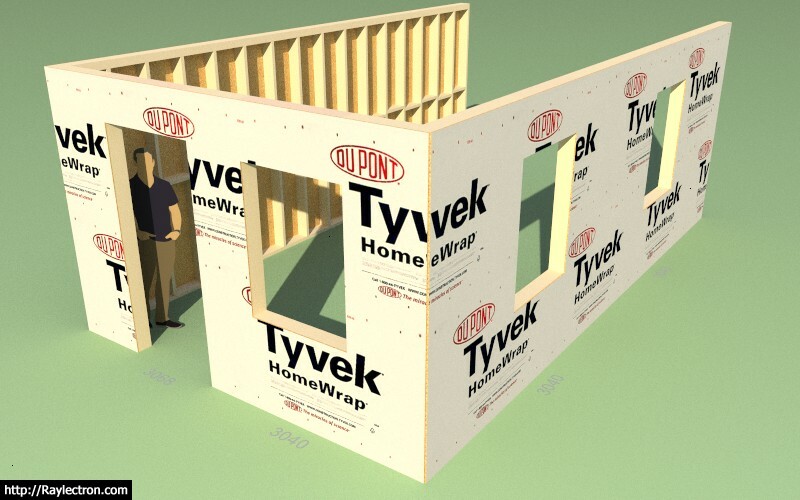 - Tyvek + OSB material added to the pre-installed plugin materials. 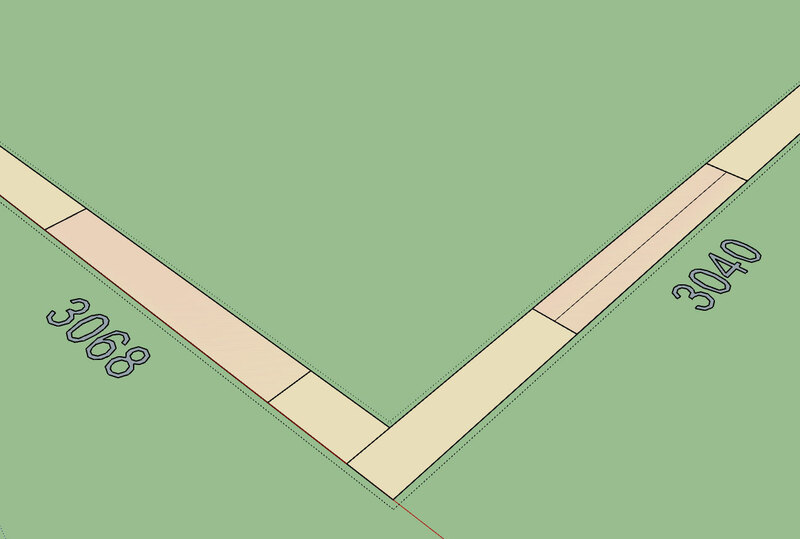 - Added 2D construction line options for sheathing, cladding and gypsum within the global settings. Taking it a bit slow today, just a few minor items and some small fires to put out, catching a bit of a breather.